It was hard work with such a hard wood but it was great fun and very rewarding! I’m supper happy with the results… But I’d love to know what Ray, you all, and everyone else on your blog thinks! Thank you for a great blade and the hours of fun it has brought me! 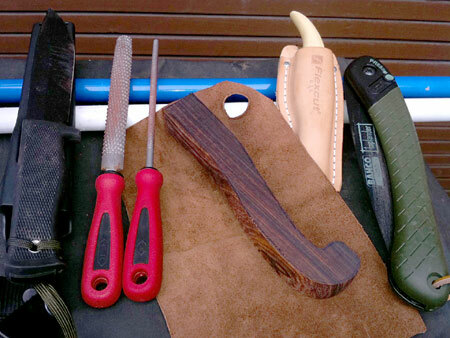 This entry was posted in Bushcraft Clothing & Equipment, Customer Posts on January 18, 2011 by Woodlore Team. Wow Chris, I have recently made one of these knife handles and I must say yours is quite more symetrical than mine. I also made it out of very hard wood (olive) so I know what it is to carve it, but how solid the final object is!